It’s been a while, but today, a real honest to goodness book review. My friend recommended and loaned me this novel by Cheryl Mendelson, set in, not surprisingly, Morningside Heights, a neighborhood on Manhattan’s Upper West Side close to Columbia University. The novel follows the Braithwaites–Ann, Charles and their three children–and a host of their friends and acquaintances who orbit around them through the streets, apartments, shops, buses and restaurants of this urban neighborhood. Be warned that you may feel daunted by the first 40-50 pages of the novel, in which there is a great deal of character introduction. Characters who keep coming at you, right when you feel you’ve gotten everyone most thoroughly down. Characters who are described at great length with voluminous access to their internal thoughts. Be warned that this is one of the those novels with very, very long paragraphs, unbroken for pages on end by the comforting, white open spaces created by conversation. Do not let the preponderance of text, especially in the beginning, scare you away. If you make it through the lengthy character exposition and the overwhelming amount of black ink on the page, you will find yourself rewarded with a lovely novel that reads like something from a previous century. It seems clear that Mendelson is a Jane Austen fan, and there’s certainly whiff of Austen around these novels in both the themes and the style. Much of the action centers on marriage, family, courtship and even inheritance. I found the novel a bit more weighty than an Austen novel might be, so perhaps it’s more like Mansfield Park than it is like Pride and Prejudice. And yet, the novel is contemporary in the New Yorker obsession with psychotherapy and in the ways in which Mendelson has her characters talk about marriage, family and love. Of course, her characters live in a very different world than Austen’s did, though there is a scene that involves the breaking off of an engagement that could have leapt right out of an Austen novel. But in the end, much as can be said for Austen, this is a novel of the mundane. Some interesting things happen, but mostly people have children, raise children, and try to navigate the difficult terrain of a marriage. 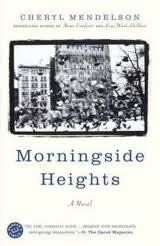 As novels of the mundane are some of my very favorite novels, I enjoyed Morningide Heights immensely. It is always a comfort to read about other people quietly working their way through life and to be able to identify the commonalities that all of us feel. Charles gave up, and sat silent. Anne understood it all and even credited his good intentions, and he knew she did. The thing about being angry with one’s spouse, he thought, was that you instinctively turned to the same spouse for solace. Because he was angry with Anne, he wanted comfort–from Anne. Most amazing of all, she managed to sympathize with him in his anger toward her. She really felt bad for him. No wonder people didn’t want to get married anymore. It made your head buzz. Morris and Merrit were lonely and afraid of something, dying probably, but Charles remembered loneliness; it wasn’t as difficult as marriage.